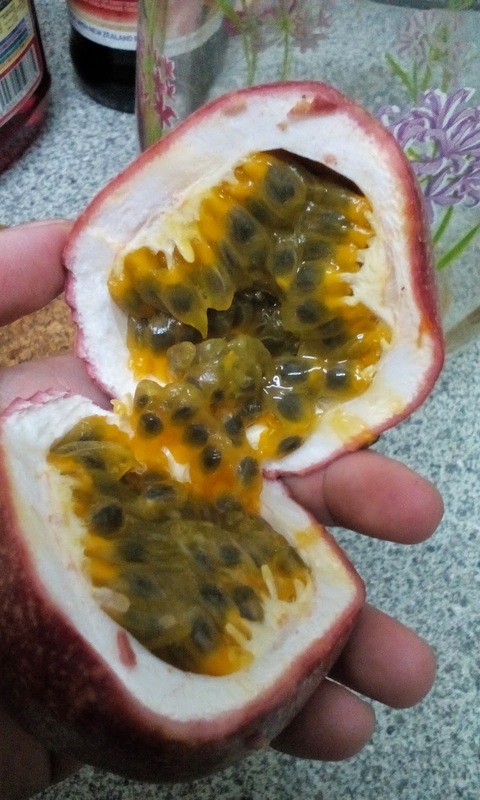 Honestly, I don't really like passionfruit but after learning of how good they are, I gave it another chance. So happened the vegetarian cafe near my office was selling some passionfruits one day so I bought a bag. One bag consists of 6 pieces and it was about RM5. I decided to make passionfruit juice. I didn't bother to blend the pulps because then I would have to strain them, which is such a hassle for me. I simply cut open the fruits, scoop out the pulps and added water, honey and ice into the jug. Unfortunately Babycakes doesn't fancy the drink because she gets all disgusted looking at the pulps and seeds. However I managed to get her to drink some of the water, minus the pulps. It was a nice refreshing drink, full of vitamins. 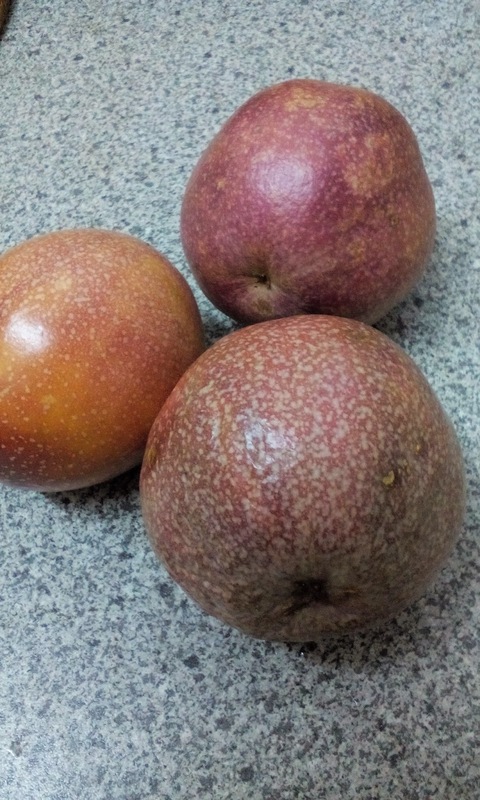 Delicious, passion fruit is rich source of antioxidants, minerals, vitamins, and fiber. 100 g fruit contains about 97 calories. The fruit is a very good source of dietary fiber. 100 g fruit pulp contains 10.4 g or 27% of fiber. Good fiber in the diet helps remove cholesterol from the body. Being a good bulk laxative, it also helps protect the colon mucous membrane by decreasing exposure time to toxic substances in the colon and wiping off cancer-causing toxic substances from the colon. The fruit carry very good levels of vitamin-A (provides about 1274 IU per 100 g), and flavonoid antioxidants such as ß-carotene and cryptoxanthin-ß. Current research studies suggest that these compounds have antioxidant properties, and along with vitamin A are essential for good eye-sight. Vitamin A is also required for maintaining healthy mucus membranes and skin. Consumption of natural fruits rich in vitamin-A, and flavonoids may helps to protect from lung and oral cavity cancers. Fresh granadilla is very rich in potassium. 100 g fruit pulp has about 348 mg of potassium. Potassium is an important component of cells and body fluids, and helps regulate heart rate and blood pressure. Furthermore, granadilla is a very good source of minerals. Iron, copper, magnesium and phosphorus are present in adequate amounts in the fruit. Mango and passionfruit? Are they a good combo? Maybe I will try next time. Thanks for the suggestion, Far! Spinach and Kale? Never had them in the form of a drink. Yet. Hehe.